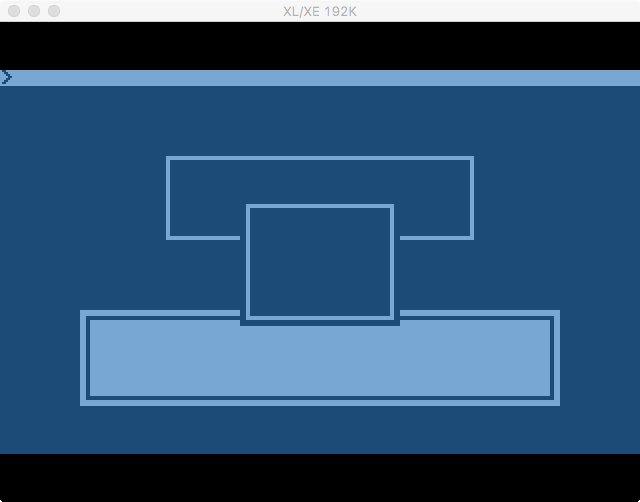 The next series of posts will document a windowing system I built for the Atari 8 bit computer using Action!. In this first post I’ll show you the windowing system is designed, and show you the first few functions to get started. To keep the windowing system somewhat simple, I chose not to include any Z ordering, and instead put window order management on the programmers shoulders. Programs are small enough on the Atari that this isn’t really a problem as far as I am concerned. Memory to store the screen contents the window replaces when drawn. I chose a simple stack based ordering system. This means windows are added to a stack as they are created. The last one added, should be the first one removed. There are a number of reason I chose this. First and foremost was simplicity. This approach brings with it less management of window screen buffer memory. It also helps keep the code size down. Next I’ll break down whats in each one. The Inverse flags are WINVON and WINVOFF. They represent the values used to set a window to be drawn in inverse video or not. The Window Status flags are WSFREE and WSUSED. They represent the values assigned to the window handles status byte. 0, the window handle is free (available). 1, the window handle is in use. The other definitions will be discussed when the time comes. This contains all the window routines. For this post, I will cover the initialization routine and the open routine. Future posts will cover other routines. First the init routine. The window system needs to be initialized before use. The initialization routine is described here. First, it turns the cursor off, sets the left margin to 0, moves the physical cursor to top left corner, then sends clear screen to CIO. Then it zeros out the window screen buffer memory, and sets the initial index to the memory which will be at byte 0 of the window memory address. Then for each of the 10 general window handles and 1 system window handle, it sets the window handle attributes to status of free, inverse off, base memory address of window screen buffer memory, and 0 for all other attributes. Last it sets the virtual cursor coordinates. ; Desc..: Initializes windowing system. Sets the default return code to no window handles available (WERNONE). It cycles through each general window handle starting at the first, looking for the first one that is not used. To do this, it finds the window handle in memory, and checks the status byte. If the window handle is free, the window handle status byte is set to used. It sets the window handle memory location pointer to the same value as the systems window screen buffer memory pointer. The system one gets updated as the window is drawn and underlying screen elements are saved to it. It also sets the size of the memory needed to store the underlying screen elements, which is the width times height of the window. It sets the other window handle attributes to match those passed in to the function. It then computes the location in screen memory where the top left of the window location should be. It draws the window. To do this, it creates each row of the window from top to bottom. This is done by creating an in-memory image of each row, then copying that memory block into screen memory at the correct location. It will also inverse the in-memory image of the row if the inverse flag was set. Then it sets the return value of the function to the window handle that was used. Last, the routine exits passing back the return value which is the window handle that was used. ; Top or bottom line "+-+"
; Middle line "| |"
The following program demonstrates the usage. This program will be built upon as the posts progress. You’ll notice LIBSTR.ACT is included as well. It has the StrInv function which is used to inverse a window. That’s it. The next post will cover window closing and background. Other posts will include window titles, printing to windows, putting characters to windows, and eventually some widgets.